This property is a detached Victorian house in Hampstead, which had no existing cellar, a timber suspended floor and an existing partial lower ground floor. London Basement were asked to carry out the construction of a basement below the house and rear and side patio’s, creating an area of 196M² (2109 sq.ft. 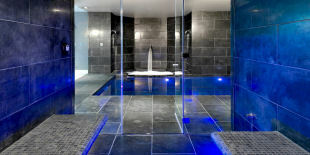 ), with a head height of 3M below the house and 2.9M below the patio’s. As you will see from the artist’s rendition, the majority of the basement space was to be used as an Art Gallery. The property had a part timber suspended, part solid floor and our clients lived in the property throughout the works, which took approx. 30 weeks. Two conveyors belts were installed from the areas of excavation into the skip situated on the road. Initially we carried out the design and installation of the temporary works required to support the existing building structure. This involved the installation of a series of cantilever needle beams passing through the external walls, at critical load points, supported on temporary compression piles placed adjacent to the external walls. This enabled us to be able to break out the existing foundations and replace them with the new designed steel support system. Contiguous piling was carried out prior to the external mass excavation, with piles augured to a depth of approximately 10 metres. Once this was completed the mass excavation was commenced using a 360° excavator and the secondary conveyor system removing soil to the front of the property. Once the excavation to slab formation level was completed, the pump sump units and associated underground drainage were installed, after which the concrete floor slab was laid to falls. Below the property, once the structural steel supports and props were in place, we carried out a two stage underpinning process, with the ground dig reduced to approx. 4000mm to allow for a finished head height of 3000mm. 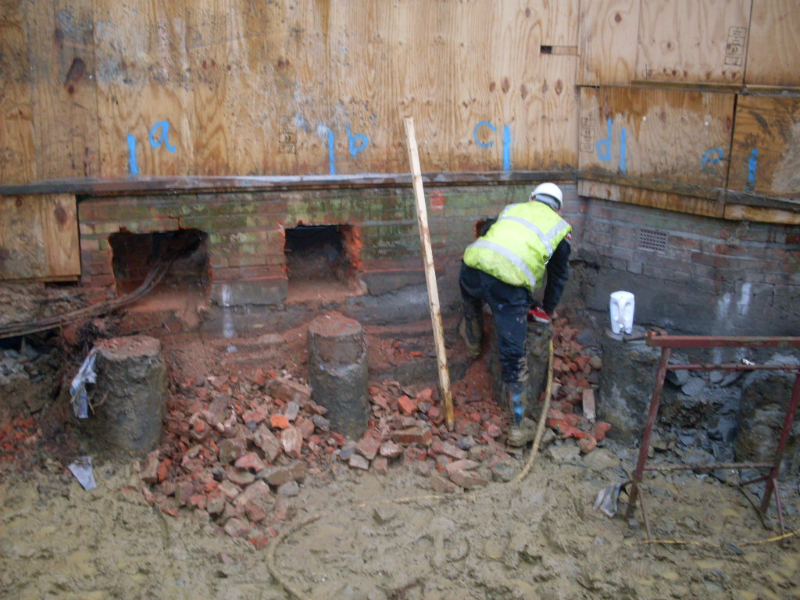 These underpinning works were carried out in strict accordance with the structural engineers design and calculations. Once all of the structural works have been completed, the waterproofing was carried out using the Delta Cavity Drain Membrane System. This is a sealed system throughout the walls and floors, which works in conjunction with the sump pumps. The floor construction was then installed with insulation, under floor heating and floor screed. On completion of the structural works, our fit out team moved in to commence the full fit out, including installing the metal framed I stud wall system throughout the perimeter walls, the supply and installation of metal framed C stud to internal wall partitions, insulation between studs to internal partitions, the supply and installation of 12.5mm plasterboard to internal and perimeter wall system and applying scrim tape and finish plaster to a smooth finish coat. The ceiling is a suspended ceiling with 12.5mm fire-line board with a plaster setting coat. All carpentry and joinery works were completed, including doors, windows, staircases and associated works. The fuseboard, full electrical and lighting installation was completed in accordance with the agreed design. 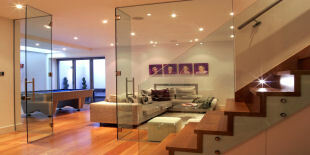 On completion of these works, full decorations were carried out to walls, ceilings and woodwork. Externally 3 structural glazed floor units were installed in the new concrete reinforced basement lid oversite. The area of garden affected by the works were made good on completion of the works.